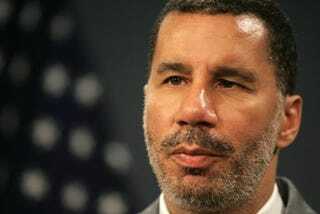 David Paterson has spoken, and the junior senator from New York is… Kirsten Gillibrand. Wait, Kirsten who? “I recognize, for many New Yorkers, this is the first time you’ve heard my name,” Gillibrand said, after Paterson introduced her at a midday press conference. But, we’ll come back to that. But first, a word in defense of the blind, black governor who has once again driven the political establishment crazy by refusing to obey convention. From the moment Caroline Kennedy came up as a potential replacement for Hillary Clinton, all of New York—meaning statehouse reporters and blind-source political operatives—went mad trying to promote, undermine, spin and generally speculate about the Camelot daughter’s candidacy. Everybody, that is, except for Paterson, who remained frustratingly, insistently nonchalant about the whole thing. He was tight-lipped and insular on one hand, and casually open on the other. He’d riff on the pluses and minuses of any candidate a reporter asked him about. He’d contradict himself in the course of a single day, appearing in one moment to support Kennedy and to oppose her in the next. I saw Gov. Paterson speak at a fundraiser during the height of the Kennedy chaos. Toward the end of his speech, he waved off the MC who sought to wrap him up, because he had a few more jokes to tell (he’s the class clown of Albany). When he finished, he apologized to the tall, blond MC by explaining that he thought she was Caroline Kennedy chasing him down again. That’s the sort of flip posture that made folks turn on him. Unable to decipher what Paterson was planning, the political class (into which he was born) charged that he’d lost control of the process. His incompetence became a boilerplate paragraph in news reports about Kennedy. And when she abruptly quit this week, it was more than anyone could take. New York’s dailies gave their readers whiplash trying to make sense of it: Kennedy pulled out because Paterson didn’t want her, one paper said. No, it was because she has tax and nanny problems, said another. No, no, it’s those long-rumored skeletons in her marital closet, offered another. What everyone agreed upon was that Paterson screwed it all up. But the reality is none of them ever knew what Paterson was thinking, and they still don’t. That’s a hallmark of his political career, one that has served him terribly well, time and time again. Paterson is the son of one of Harlem’s historic power brokers, Basil Paterson. He grew up inside that political machine, under the tutelage of folks like David Dinkins and Charlie Rangel. He got his start in politics when the Harlem machine handed him a state senate seat that didn’t mean much—the Democrats were then total non-players in a chamber controlled by powerful Republicans. Paterson was a nobody among nobodys, just Basil’s kid, a kid who clearly didn’t share his dad’s drive. So when Paterson staged a coup to take over the caucus in 2002, it came as something of a shock. Everyone laughed when he said he was going to make the powerless caucus a real player. He was too affable, too cozy with the powerful Republican majority leader. But by the time Paterson left the chamber to be Eliot Spitzer’s lieutenant governor, his Democrats were in fact breathing down the Republicans’ neck. They took control of the chamber in November. Which was why the political class was once again shocked when he joined Spitzer’s team. It defied logic. He was stepping away from the power he had built to take a largely meaningless post under a pugnacious, autocratic governor who would surely not share the stage. And he was doing it in open defiance of the machine with which his name was synonymous; Harlem’s establishment had already publicly backed someone else, Leecia Eve, a black lawyer and former counsel to Hillary Clinton. Once again, everyone assumed he was an affable fool. Whatever his calculations were—and who knows, really—now he’s New York’s first black governor. And in the wake of Spitzer’s disastrously combative reign over Albany, the same political class that pooh-poohed his affability has largely marveled at his ability to work with folks and keep the state’s doors open in the middle of an unprecedented economic crisis. So why Kirsten Gillibrand? Why pick the one person whom no power broker supported, who appears to offer him no useful political chit? Whoever tells you they know the answer is a liar. But the fact is that Paterson will face a bruising re-election campaign in 2010. Maybe he figures Gillibrand’s upstate base will be an ace-in-the-hole for him against Democratic and Republican challengers alike. Maybe he relates to her bio: She beat the establishment candidate to take her congressional seat in 2006, without having ever held elective office. Maybe he felt like he just couldn’t trust Andrew Cuomo—he certainly wouldn’t be the first to feel that way.